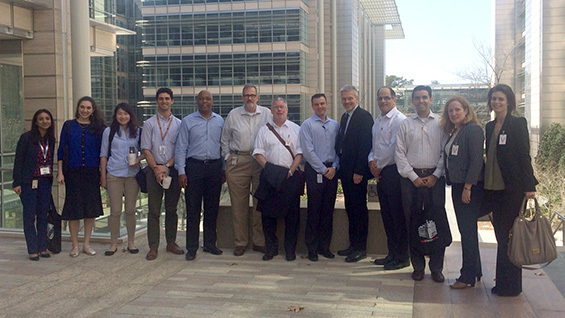 Acting President Bill Mea and Acting Dean of The Albert Nerken School of Engineering, Dr. Richard Stock, visited the ExxonMobil Houston Campus on Thursday, March 3 for a luncheon with nine Cooper alumni working for the company. The event provided an opportunity for alumni to hear about the current state of The Cooper Union and plans for the school’s future. As ExxonMobil has an active recruiting program at Cooper, Acting Dean Stock and engineering alumni were able to discuss the growth opportunities for more students and alumni at the company. ExxonMobil also sponsors the Cooper Union Motorsports team in the annual Formula SAE competition. The team designs and builds open cockpit formula-style cars to compete in an intercollegiate design competition hosted by the Society of Automotive Engineers. The afternoon provided an excellent opportunity for visitors from Cooper to learn more about the pathways students have forged in their careers and lives after graduating. Afterwards, the group went on a tour of ExxonMobil’s campus, highlighting the dynamic and collaborative work environment, lab and research facility capabilities, as well as a demonstration of how ExxonMobil leverages visualization technology to support exploration activities.